Apples are very good fruits that contains a whole lot of healthy nutrients. It is one of the first that is introduced as baby’s first food and most store-bought apple purees are recommended as suitable for babies from four (4) months. 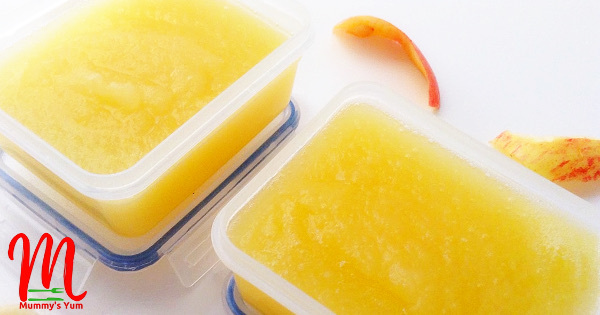 I always preferred making my baby’s fruit puree and this is one of the simplest and easiest to make. So, this is for mothers, especially first time mums that are normally at a loss on what to start for their baby. You don’t need to buy already made if you can do it yourself. Store-bought purees can be your emergency option. Apple puree can be fed alone, sometimes with breastmilk added to it or it can be added to baby’s meal. Add to pap (akamu or ogi, in Igbo and Yoruba respectively), mash with rice, mix with plain natural yoghurt, combine with other fruits to make a lovely mixed fruit delight for baby. 1-2 Apples – make sure it is firm and fresh. Also, sweet ones are better, you don’t want to put baby off by giving a sour apple. Peel apples and remove the core (the middle part with some seeds) and cut into cubes. Put in a pot, add 2-3 tablespoons of water (apple releases liquid when cooking, so too much water will make it more watery like mine). Cook for 4-6 minutes or until tender. Blend to a smooth consistency, adding more water at this point if you want it less thicker. You can equally use a masher to mash it and use a strainer to get the smooth puree out. Serve once warm or you can put in containers and store in the freezer. Remember to drop a comment below, share with friends, like and follow on Facebook, Instagram and Twitter. Be the first to get notified of more kid-friendly ideas by joining the mailing list, for notifications delivered right in your box. 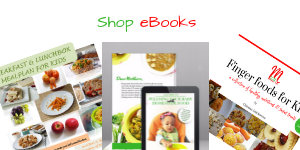 I’m glad I came across you website, My baby is turning 6months in 2weeks and its a relief for me knowing I can get healthy recipes for her here. Instead of feeding her store bought cereal all day long………. I already bought some mullets to make brown pap, I’m also happy that my left over uncooked brown rice will also be put to good use. No more bland baby food like I did with my first. Glad I found you. I’m definitely gonna subscribe. Love love love your website! God bless you for this! Thank you so much Omolayo. Great to have you here. Yes Shade, you surely can. My baby will turn 6months in 2 weeks time. We’ve been EBF and I am already excited,knowing we are soon to transition to eating solids. Now I have my go-to place for yum babyfood recipes💃. Please keep it coming. I’m subscribing already ! LoL. Thank you so much Dheemy. I hope baby enjoys the recipes and more to come. Ebele, you just made my day. Thanks and hope our little prince enjoys all Mummy’s Yum baby recipes. Lets keep our fingers crossed. More are coming by God’s grace. Mummy’s yum is just the best! My babies have always loved my homemade fruits & veggies puree. Instead of cooking the fruits or vegetables, I peel and steam them until soft and tender. As they grow older, I liven things up a bit by spicing them with a dash of nutmeg or cinnamon and a little butter (depending on what fruit/ vegetable I used). Thanks. Julia-Faith, that is exactly the spirit and livening it up or leaving some chunks in it is very good too. Steaming is the best method for coking vegetables, however cooking with a little water for a very short time is equally good. Most people dont have a steamer, hence using this method as minimal nutrient is lost. You are very welcome Omolara. Thanks too.